October is World Hunger Month. Do your bit by supporting the KFC Add Hope campaign, and join the journey of hope in feeding a child. When you see the world through the eyes of a child, you see things differently. Children always believe that tomorrow will be better, because children always believe in hope. They know they will grow up to be doctors, astronauts and police officers. Thanks to KFC Add Hope, a goodwill initiative and nationwide fundraiser dedicated to feeding South Africa’s children, they’re much closer to achieving their dreams. This October, as South Africa recognises World Hunger Month, Add Hope will take you on a journey of hope seen through the eyes of the children they feed. Every day throughout October, Add Hope will tell a different story of hope, all made possible through R2 donations that allow children to reach for their dreams. During October, these special children will show you what they hope for when they grow up, made possible because they have access to a nutritional meal daily to help them learn better at school. No child can learn on an empty stomach. Add Hope believes that kids should be kids. Kids should be able to learn at school and play with their friends. Access to nutritious meals daily through Add Hope can do this for them. Every time you Add Hope to your order at KFC, you donate R2 ensuring that a child gets a nutritious meal. Thanks to KFC franchisee contributions and the generous customer donations, Add Hope has raised a staggering R210 million in the past six years. This means we are able to feed more than 70 000 children every month. R2 is all it takes. Add Hope can be added in all 750 KFC stores nationwide, 365 days a year and allows KFC to provide children with meals from 90 carefully selected national and community beneficiaries, who work tirelessly and passionately to provide hope to every single child, every single day. 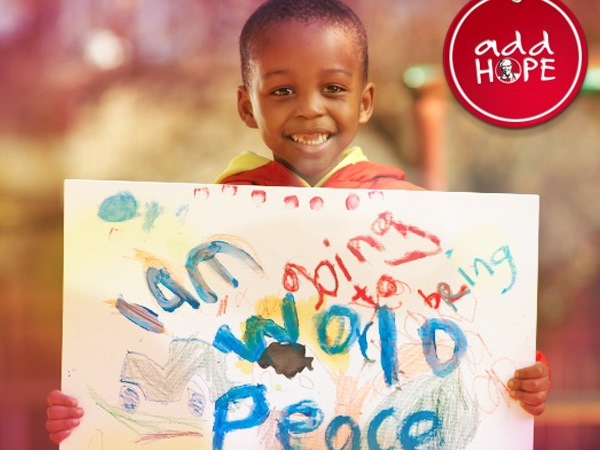 Please remember to Add Hope at your nearest KFC store or donate online on www.addhope.co.za. Follow the journey of hope seen through the eyes of children and see how your R2 fills them with more than just hope at addhope.co.za.